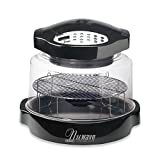 ✓ Multiple cooking options - broil, fry, dehydrate, etc. Once you start using the NuWave Oven Pro Plus, you will wonder why you would even bother cooking any other way. Flames are so inaccurate and difficult to gauge, and ovens can take forever to get your food. With the Oven Pro Plus, you can get better results in a fraction of the time. It’s safer, more convenient, more portable, and more reliable. What else could you want in a kitchen appliance? Are you looking for a quick and easy way to prepare food for you and your family? Do you want an appliance that can handle all of your cooking needs? If so, then you will want to try out the NuWave Oven Pro Plus. In this NuWave 20631 Oven Pro Plus Review, we will tell you about its key features, pros and cons that make your cooking much easier and more convenient. This machine can do everything you need it to do – and more. Best of all, it uses high-tech cooking methods so that you don’t have to sit and wait for hours to get a hot and delicious meal. No matter what you’re craving, the Oven Pro Plus can make sure that it’s cooked to perfection every time. 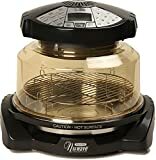 Many people question if a NuWave oven is an air fryer. The answer is no. While the company has introduced NuWave air fryers, the oven ones are different. 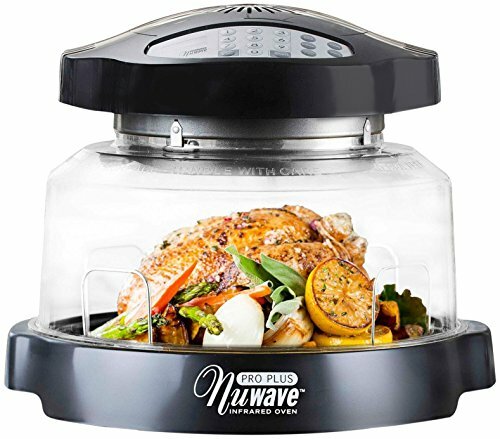 The NuWave Oven uses three different systems simultaneously to cook food: infrared, conduction, and convection. The conduction system uses heat transfer as a conventional oven does. 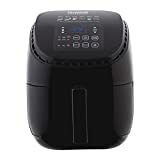 The convection system uses hot air circulation to cook food from all directions as an air fryer or convection oven does. The last heating system is infrared heat. It uses an invisible energy that cooks the food on the inside and outside at the same time. With these three systems working simultaneously, your food will be cooked evenly, perfectly, and rapidly. Check out more information on NuWave Oven Reviews. Let’s see what this countertop oven has to offer. One of the issues with most ovens is that you have to rely on a dial to get the proper temperature. Not only that, but older models are not as efficient, meaning that they do not get to the right temp anyway. With the Oven Pro Plus, you have all the power at your fingertips. This oven can go from 100-350 degrees Fahrenheit as quickly and precisely as possible. To make it even better, you can control the temperature within one degree. No more guesswork! The other excellent thing about this control panel is that it makes cooking a breeze. Simply enter the heat level, the cooking method, the time, and you’re all set! Also, because you can see your food while it cooks, you can check on it without having to lose heat. Although you will be buying the NuWave Oven Pro Plus to make your life easier, it’s also good to know that you’ll be saving money on your utility bill while you’re at it. Because this oven uses convection and infrared cooking methods, you won’t be draining electricity as much as you would with another appliance. In fact, this machine can use up to 75% less energy than similar cooking methods, and that’s not even including the fact that you don’t have to rely on natural gas to get it started! If you replace all of your oven cooking with the NuWave, you will notice a significant drop in your electric and gas bills. Another reason why this machine is so efficient is that it cooks much faster as well. In most cases, your meal can be ready in about half the time it would with a regular oven. Save time and money with the Oven Pro Plus. When you first look at this device, you may be wondering how safe it is to use something with a large see-through dome. Although it’s not made of glass, it can still make you feel a bit uneasy. Fortunately, this NuWave oven part is durable and shatter-proof, so worry no more. The great thing about having this dome is that you can see your food much more clearly. Oven windows can be hard to see through, and you only get a front-side view of your meal. In this case, you can view it from all angles, so you can spot any parts that are not cooking evenly (although that rarely happens). Also, this dome comes with an extender so that you can fit more food inside at once. In fact, you can put a 16-pound turkey in there and still have room for some fixings! Family dinner has never been easier. Convection Cooking – And More! So what’s so great about the NuWave Oven Pro Plus? Why is it so much more efficient and powerful than traditional ovens? The secret is in the cooking methods. Convection heating uses a fan to blow superheated air around your food, helping it get hot much faster. In a traditional setup, the air gradually gets warmer, which takes time to heat the inside of your food. Convection cooking gets to temp in a fraction of the time, and the airflow ensures your dishes are cooked thoroughly. This machine also offers infrared cooking. Rather than using a flame or hot air, it uses infrared beams to heat your food from the inside out. Think of it as a high-tech microwave that’s even more powerful and reliable. Overall, with this machine, you can bake, broil, roast, fry, and dehydrate. It’s the ultimate kitchen appliance! Learn more about NuWave Oven cooking guide. Want to compare this model with other NuWave ovens? 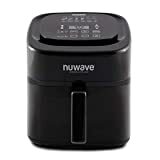 Check out a product comparison table on NuWave Oven Reviews.